The Royal Institution of Chartered Surveyors (RICS) has invited me to talk tomorrow at its advanced building conservation school about the historical recording that’s been taking place on my cottages. This work has been aimed at gaining a greater understanding of the property’s history in order to inform the renovation plans. 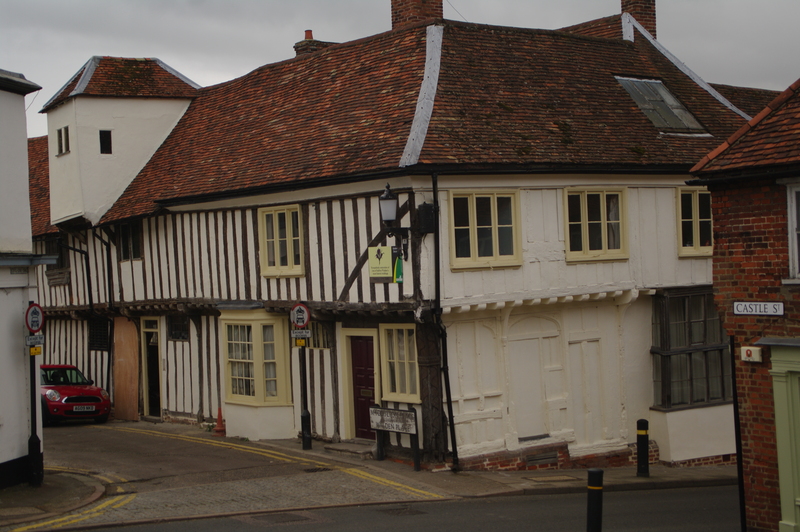 Delegates will also visit my home during the afternoon as part of a tour that local surveyor Tony Chapman and I are conducting for them of Saffron Walden’s medieval core, which includes a trip, too, to see the town archives. 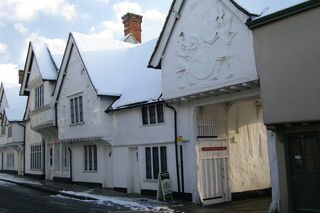 The session on recording takes place afterwards at 1 Myddylton Place (www.onemyddlytonplace.co.uk) (pictured), the historic home of Tony and his family, where we’ll be dining as well. There are four principal strands to my recording. The first has involved researching documentary sources and I’m very fortunate that the excellent town library is just around the corner. This preliminary research has been complemented by on-site investigations. The second strand, consequently, has comprised an archaeological survey, including architectural paint research and wallpaper analysis. Cathy Littlejohn, a director at Hare & Humphreys Ltd (www.hare-humphreys.co.uk), which has been carrying out the paint research for me, is also lecturing at Myddlyton Place tomorrow. The third and fourth strands of my recording have entailed a measured survey along with photography and filming. Although the recording is informing the project, further discoveries are being made during the renovation work that advance my understanding of the property’s history. Future blogs will reveal more. 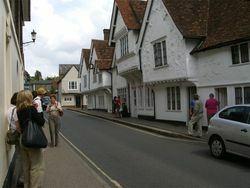 I hosted a visit the other day for about a dozen local people representing the Recorders of Uttlesford History (www.recordinguttlesfordhistory.org.uk). The group was set up to record the present and ensure that valuable artefacts and archives of the past are conserved. The Recorders wished to see my property in its current unrenovated condition and plan to return again later. Over the years, there’s been much local interest in the range of buildings that includes my cottages. When purchasing them, I discovered that local donations and a wider appeal helped the Ancient Buildings Trust (ABT) acquire the range in the 1930s to protect it from possible harm. The ABT was the property-holding arm of the SPAB, who, coincidentally, I work for! To secure the donors’ gift should the ABT sell its interest, it took a long lease and vested the freehold in the National Trust. The ABT sold its lease in the 1960s after overhauling the greater part of the range. However, it hadn’t been able to gain vacant possession of what are now my two cottages to modernise these. They’ve changed little since, so in many ways I’m picking up where the ABT left off over 40 years ago. 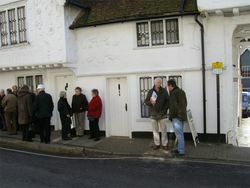 Thirty members of the Stansted Mountfitchet Local History Society descended on my house the other day. 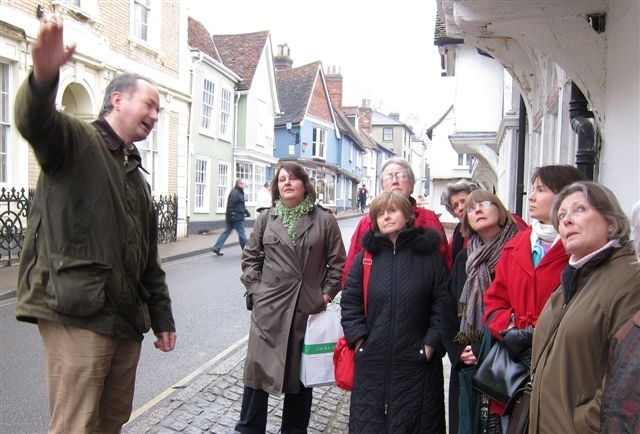 Once again, I’ve leapt at the chance to be a tour guide, having already hosted visits by several SPAB parties. It’s a good time for people to see the property whilst it is still in a fairly untouched state and I believe that the visits will help increase the awareness of old buildings and the heritage of the town generally. The more that people appreciate the historic environment, the more likely they are to care about it. There’s much concern locally at the moment about the need to protect the area and its unique character from over-development. My vis itors from Stansted were particularly anxious about the possibility of a second runway at the nearby airport, which is opposed by 89% of people in the district and would involve the callous destruction of at least 35 historic buildings. As elsewhere, there’s also unease about the impact of hundreds of centrally-imposed new houses and more out-of-town supermarket provision. A campaign has recently been launched to save Saffron Walden Town Centre (www.savewaldentowncentre.org). It’s very tempting to get stuck straight into work on site after taking on an old building but I am taking time to understand my property’s history and construction first. My house has survived for 500 years remarkably unscathed and I’m acutely aware that by acting in haste I could inadvertently cause serious damage in literally just a few minutes. The more you know about an old building, the more successful a project is likely to be. For example, a good understanding of my house’s history will, I hope, help me to make sensible changes that respect its historic fabric. And an appreciation of the way it is built should assist me in seeing why any deterioration has set in and how it might successfully be put right. I must emphasise that the knowledge I gain about my house won’t be used to restore it back to some former point in time, which would be anathema to the principles of the SPAB and could create an unsatisfactory fake. I’ll also use non-destructive survey techniques in addition to documentary research to avoid harming the building. Essential maintenance will, of course, still be required pending the start of major work. 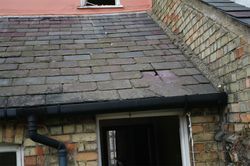 One of my immediate jobs has been to reinstate the odd slipped slate on the Victorian extension (pictured) to keep out the rain. I was leaving the house the other morning when I became aware of a passer-by waiting in the snow for me. It turned out to be an elderly lady, Mrs Selby, who had lived in part of my property from the 1920s right up until just before I took possession. I knew she was now in sheltered accommodation in the town but this was the first time we had met. Our chance encounter was timely. As well as handing her a Christmas card that had arrived at her old address, I was also able to raise the possibility of us getting together over the next few months to talk about her memories of living in the house. In line with good building conservation practice, I’m hoping to investigate the building and its history thoroughly before commencing any significant work. Mrs Selby evidently has much to tell me. She has already mentioned an occasion in the 1940s when a lorry collided with the oversailing first floor wall, narrowly missing her but breaking a cast iron window frame. Fortunately, the pavement has since been widened to keep traffic further away.